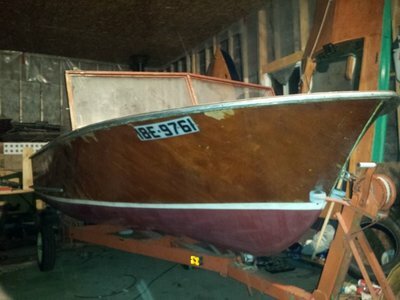 Hey guys, here are a few pics of a 16 foot customline runabout I recently bought. 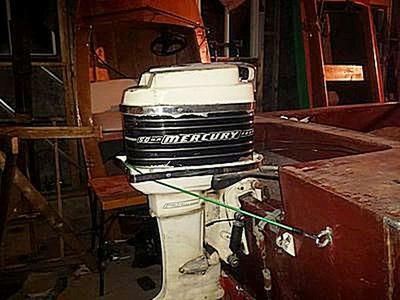 It is my first "bigger boat" and needs much repair. There is a sizeable hole in the ply bottom, and a few tender spots near the rear, not too scary as the structural parts are good, but I will be asking for your help and advise on refinishing and any info on the Kiekhaefer merc. It was very fortunate for me that all the original brightwork and emblems were saved and in a box included with the project. 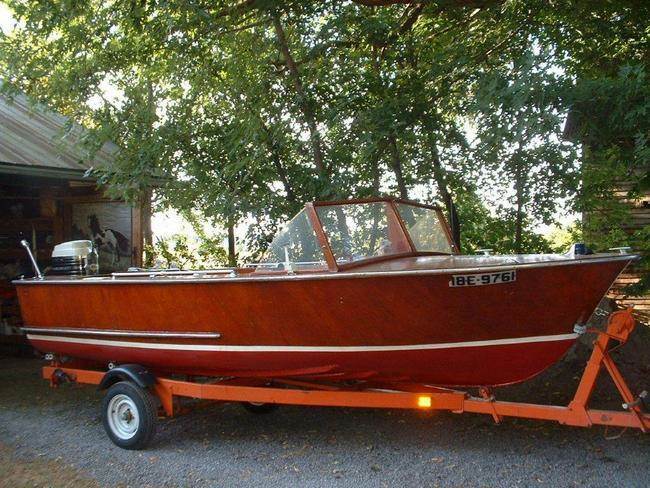 I got a great deal from a very great guy who wanted for someone to restore this boat because he was unable, and I have promised him photos of the boat as work progresses this winter. I am not sure it will be done for summer 2015 but I want to do a good job and any advise is much appreciated. 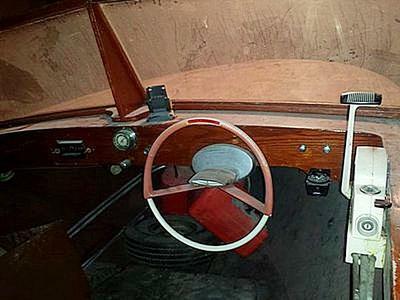 I have the same steering wheel in my 14' whirlwind. Can you send me a pic of the center hub on the steering wheel? Mine is missing, and I'm in search for the original. This is one of the photos sent to me by the former owner of the boat while it was in it's former glory, I sure hope i can get it looking half that good again! I have epoxy resin for the hull repair, she's painted on the outside bottom so once smooth the only visible repair may be inside depending how much time I spend. To refinish the outside hull above water, and top decks, I am assuming "there is no way but the hard way" and it all has to be sanded to wood. Is a coat of epoxy resin the way to go with varnish topcoats? Also, could one sand and stain the old wood a bit darker prior and get a somewhat even color? It is absolutely not an option to paint this old wood, so one way or another I expect to put in the elbow grease, but one time would be better than doing it twice. I can't start the work for several weeks, but will put up some pics when I do. Wow am I ever excited! Matt looks good to me to repair hole in hull if you can cut 6 inch around the hole with router. Just lay in a veneer. Clean cut the hole first, check for rot, do a 4 inch cut out on the inside first then drop in a veneer. You can use 'Lepage's glue' or resin. The resin is faster but costs more. There are lots of ways to pull the 3 veneers firm together. Clamp a flexible piece of plywood / stich and glue/ that's drill holes twist wire let set fill holes. There's lots of was to go old school, a good sharp or second hand set of chisels if they're sharp this will do the work of a router. Gunnels can be scarfed or cut clean epoxy screwed and stiffened on both side with new wood. Give it your own look and there are paints out there that stretch and look like a glass boat and can be applied with a brush. The old Mercs are gas eaters, the new ones eat less.